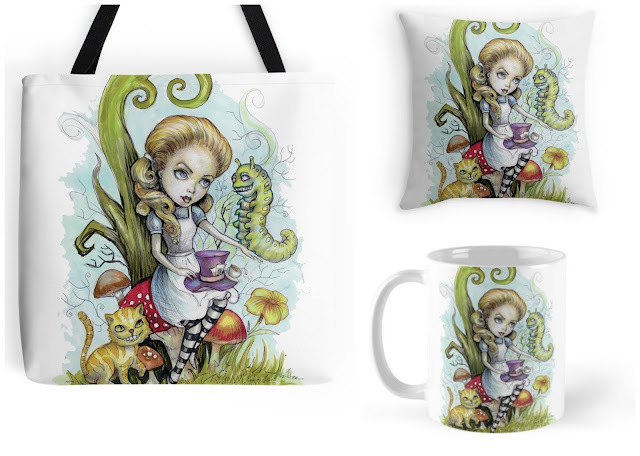 Enter this giveaway for a chance to win an Alice In Wonderland tote bag, mug and pillow set designed by Diana Levin and an Alice book of choice worth $11. I love everything about Alice In Wonderland! The characters, the imagination, the adventure and the ability to create magical worlds in my head after dreaming about it. Alice In Wonderland is my favorite fairy tale of all time! I love just about everything! A magical adventure that will be around for ever! I love how unique the story is and how it stands the test of time! In the end Alice gets back home and she really had a great time in her wonderland. It was amazing! it´s a lovely story !!! I like everything about it, like the book itself was made for me. When I was younger, I'd carry it with me everywhere. I enjoyed the general theme of the book, the abstract nature of a second world that the writer managed to capture perfectly, but the only one who could understand the world was Alice, and everyone else just thought she was mad. I just love the surrealism/magical realism aspect of it. Everything is wonderfully absurd. I love Alice in Wonderland! I love that it's an empowering book for little girls to listen to their imagination. I love Alice in Wonderland because my daughter loves Alice. I like that it fuels my own imagination. I love everything about Alice In Wonderland. The characters are amazing, so unique and colourful. It's a place where you can escape to. I love that it is a great story for all ages and the eclectic characters are so entertaining! I love all the characters at the Mad Hatter's Tea Party! I how whimsical it is, yet dark as well. "Have I gone mad? I'm afraid so. You're entirely bonkers. But I'll tell you a secret, all the best people are. "Love the imagination and the possibilities!! I always loved the illustrations in the Tenniel version. The Cheshire cat surreal but scary too meow and I would avoid the Red Queen. I like the characters, there are a lot of them. Especially the Cheshire Cat. I really like the fantasy world of Alice in Wonderland, it is a very imaginative story with lovely characters. I like when Alice drinks the potions. A great giveaway thank you. I think it's the sheer escapism of the story and the creative genius behind it. I love reading about the fascinating characters in Alice in Wonderland. I love all the mad and zany characters best, but the universe created for Alice's adventure is phenomenal. I like the fantasy & adventure. I like how much the books stimulate imagination. I like how naive Alice is. Makes things more fun. I like the fantastical, whimsical quality of Alice in Wonderland. The quirky characters she meets and the crazy obstacles she overcomes. I love how creative it is. Its a completely different world. Those characters are one of a kind. And the fact that is legendary. I love how it takes me off to a different world...with singing flowers and a Mad Hatter's tea party! I love the dark wonder of its vision. I like this story because I have been reading it since I was a child and it brings back all those memories. It's something I could easy connect to. They ways she discovers new worlds over and over again. I love every detail of it. I love how a girl travels in an unknown world that's full of mysteries and adventures. What I like about Alice in Wonderland is the timeless story. Wonderland is the mysterious place full of surprises. I love the fact it's all a surreal and bizarre world! The story is fun, believable (!!!) and timeless. The nonsensical of it all. It's so very childlike and endearing. Nothing is off limits and anything is possible. It's magical full of fantasy one of the best childhood books I read. Such a wild and fabulous story.